Air squats, also known as body weight squats are a staple beginner move for working the lower body. When you want to ramp up the intensity however, air squats can be a little too basic, meaning you need to switch things up and start performing regular squats with weight. This doesn't mean that air squats become redundant in your training, just that you need to find a way to make them a little more challenging. Both air squats and weighted squats have their advantages and disadvantages. Air squats are a must if you train at home with no equipment and still want to build your legs. You can make them harder by increasing the number of repetitions you do, going lower or slowing down the tempo and performing them slowly. 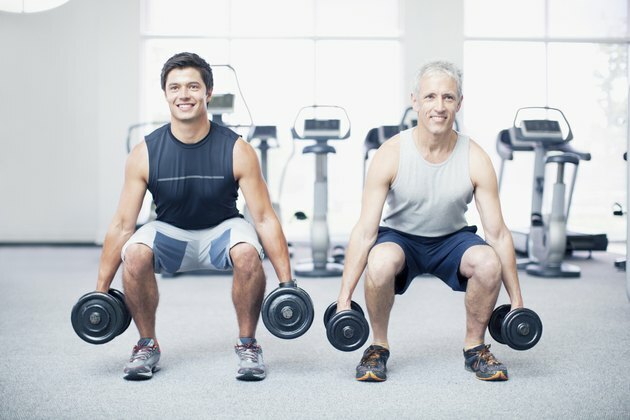 If you want to get stronger though, adding weight is essential -- you need progressive overload in the form of heavier weights, so hit the gym, grab a barbell or pair of dumbbells and go to town.